This is awesome. I learnt a lot from your blogs. hope all will learn. Thanks for posting this. Hey manish, I tried using your code, but everytime I try to print a document, it says "Document missing". There is no error in my address, I have checked repeatedly. Instead of using Environment.getExternalStorageDirectory().getAbsolutePath() + "/personal/xyz.pdf", i have hard - coded the path. Can you please help me? 1)are you try to print pdf file? 2)file is inside your sdcard or in phone memory? if in sdcard please move to phone memory. And can you print your file path log and error please? So I can suggest right way..
Hey Manish, I wanted to print a pdf stored in some URL, since this option seemed to be the best for the app I'm making, any suggestions on how to print a pdf stored online ? Hi Manish Srivastava, Thank you for sharing. I have a question: Are there other way to print by wifi in android? As this needs an internet connection, it depends at end user whether it is SIM Card internet or a wi-fi.internet. So I don't think wi-fi matters. Yes it matters if we want an internet connection. At code perspective, I don't think so. I hope you understand now. i have added a classic Epson printer to Google drive and ur code is running as well and give the message print job added. But problem is I have'nt get print from printer. 1) login with gmail account in your desktop google chrome ans use same gmail account in your mobile device for printing. 2)go to setting option in your chrome and from there add cloud printer which one attached to your desktop. 3)now print from mobile device it will show you all attached printer list and choose one from them. i have done these steps already. Problem is my file sometimes added in print jobs with error sign. I think you are getting data==null because of big size of attachment or any other reason. Please test on any other device is it working fine or same issue you are facing? Do you know how to print data by using USB hosting?. If you know please post that too. Anyhow...please give me some guidance on how best (easily) to adapt your sample codes above, to make them work in my own application which is utitlizing "persistent storage" and ListView custom adapter to allow user to select their notes from a list, and be able to print them. Ps. Manish, I tried to also ask about this on a "Hangout" on Google+ community. I am new to Google + as I am to this androidHub forum so please excuse anything from my posts that seem a bit strange, long or out of place. I just wanted to be clear as to where I am with my own Android Project and how best you can help me. I also did not know that Google+ "Hangout" posts are limited by the number of characters you can post. So thats why I came here and decided to elaborate on my own issue. Thanks so much for your immediate and kind reply to this. I tried to implement your code into my project...and did all the necessary debugging to get most (if not all the bugs out). To try and implement your code...i show below (all the following changes I had to make).... and now when I try to use the context menu option to Print out a note item to my Printer, nothing happens. I am not getting any errors, but Nothing happens and nothing is printed on my printer whatsoever). I am testing this on a Samsung Galaxy Note 3 --Android Kitkat operating system. Please keep in mind that I have already registered my HP LaserJet P2035n printer with Google Cloud Print (on my Google + account using the Chrome Browser --successfully. In fact, when I go to a different Note Taking application that you may have heard of called "S Note... I am able to use the "Print" option on a Note from that application, and I am able to Print the item just fine. So I seem to have setup my Printer as well as my Android Smartphone device, to utitlize Google Cloud Print successfuly, as I am able to print a S Note item. However, using your code, nothing is printing and I need to figure out why. Here is what I have done in my own application thusfar. 2) I have created my PrintDialogActivity.java exactly as you have prescribed. I have also bound that activity to the print_dialog.xml layout file as you suggest. Which means my print_dialog.xml file is also exactly setup like yours. The only thing I did not do (*since I dont think I need to in my case*) was to creaet a "Print" button inside my activity_main.xml ..... the reason is because I am using a context menu to allow the user to initiate the print job. And you are using a button. So please tell me why Nothing is printing out on my printer ? I am totally lost. After some more careful analysis of my code, I realized that in my intent call from my MainActivity.java, I was misssing some critical lines that you actually HAD , in your else clause. Let me show you what my current else clause looks like. Can you please tell me how I can adapt your code to work with a case like MINE where I AM NOT reading any PDF file that I wish to print. In my case, as I stated earlier, I am allowing the user to Select a ListView Note Item from a LIST and I display a Conext Menu with an option allowing them to HOPEFULLY be able to Print their Note to their Cloud Printer (which has already been setup presumably ahead of time by that user). I dont want my Application to be responsible for helping them setup (configure) their cloud printer (as far as registering it with their Google + account in Chrome -- meaning finding it on their network and setting it in their Google + account for Cloud Printing). I also dont want to be responsible for them downloading and setting up the Google Cloud Print (free app from market place). I ONLY WANT that they should be able to do a print. So given that I dont have a file xyz.pdf (which is not created by my app and is not existing)... How do I modify your code to make it work in my situation ? Hey friend, thanks for your onwer. And i am sorry this time your problem seems big and i have tight dead line so i cant able to look on it.. This is my real question from anyone who can help me please. 2)Using cloud printer what I am doing. But in both case you need a file like you have a listview nd want to print it so you need to write this data into a file then only you can print. Well why you are thinking like that? Make it at your end user will not know about your internal code. After print the file just remove that from disc. Just forget android for a minute and let me know can you print a variable in java or in any language using desktop when there a printer attach with your desktop? You need to print an object, file etc.. Please don't mind try over the world and do Google there are some chargeable library and they have own printing machine, might be they help you. Well if you got anything please let me know I am interested to know. Since you're writing to the file system you also need to add . Ur code works like charm. I have a doubt that can i just print a file from my external storage ? Hi Manish.. Thanks for this tutorial. I am developing a android application. I have completed all the functions. But Now I want to generate a bill as pdf and print it. Can you suggest me any printer for bill printing and can you give me any samples for pdf generator. I need to print images, how to print images I have the path. I Guess this is just because of NDK code on Emulator or NEXUS device. May I know which device phone you are using? And your chrome have global login and attached to a printer? Dear Manish, Thanks in advance for your help, I have one question mate, for using Clous Printer, the android device and the printer have to be conected in the the same network. or Can I use my android device from an external network? You must login into google chrome through your laptop or desktop and printer should be attached to your laptop. 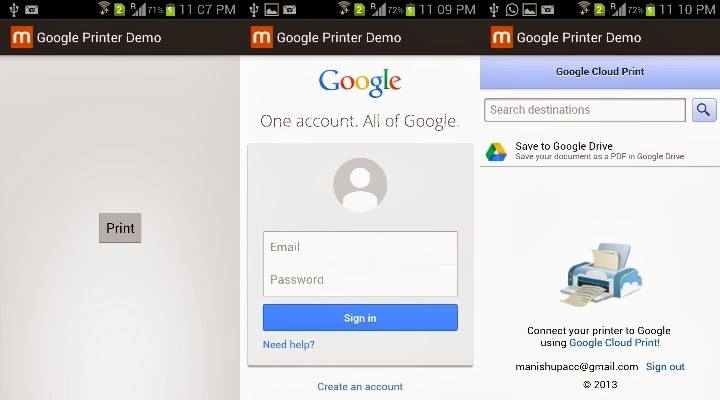 Then using same google chrome login from anywhere you can access cloud printer from your android phone. Same network is not required. Hi Manish, I am trying to print a pdf stored in the internal memory, but when appear the popup of cloud print, don´t appear the pdf, i am sure that the patch is right, can you help me? Off-course you can print a pdf file, please debug your code there should be miner mistake. I can't suggest anything without code. hi, thanks for the code, it's awesome. i got 1 more question. how can i use the android to connect the printer by TCP/IP?